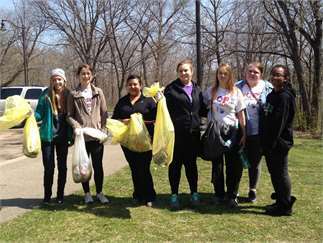 Taking place just off of West River Parkway, this family-friendly cleanup is an Earth Day tradition in the Minneapolis River Gorge. We've returned to this site year after year and have noticed a dramatic improvement to the area thanks to dedicated volunteers like you! To participate, simply show up at either E 36th St & W River Parkway or E 44th St & W River Parkway at 9:30 am on April 20 to sign-in with Friends of the Mississippi River (FMR) staff. We'll provide all of the supplies, however, if you have your own gloves feel free to bring them along. Sturdy shoes are strongly suggested as well as dressing in layers for the weather.